The power cords for the switch ship separately and are specific to the country of installation. See Power Cord Requirements. The facility power receptacles for the power cords should be located such that the power cords are routed out of the way, either to the sides of the rack or under the floor. When live power is delivered to the receptacles at the front of the chassis, standby and main power is made available by the power supplies. 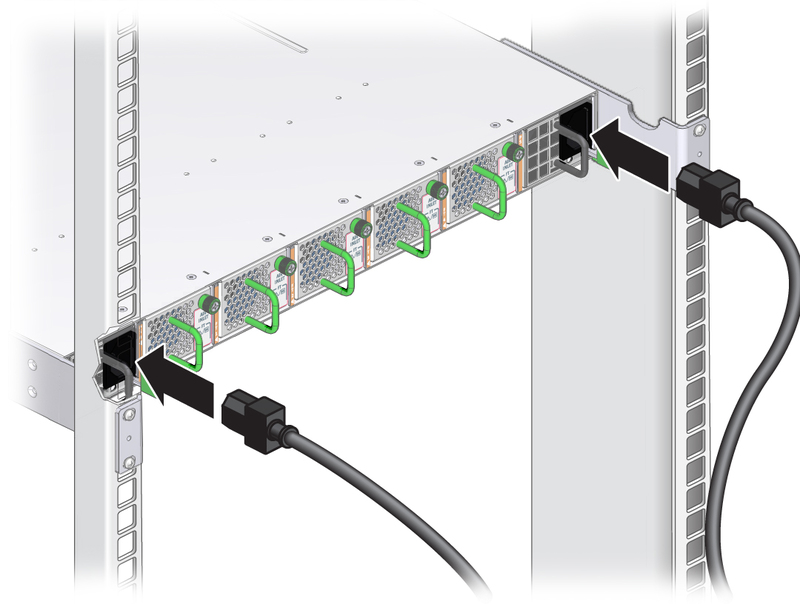 When standby power is distributed to the chassis, the management controller is powered on. The main power is supplied for the switch chip and fans. Ensure that the circuit breakers for the facility power are switched off. Plug the power cords into the receptacles at the front of the switch chassis. Route the end of each power cord to its respective facility power receptacle. Use cable ties or hook and loop fastener straps to bundle and secure the cord. Plug each power cord into the receptacle. Note - To provide redundancy, connect each power cord to a separate power source. The switch can operate with only one power connection, but there is no redundancy in that case. Energize the circuit breakers so that the power receptacles are live. Verify that the status LEDs for each power supply indicate normal operation. The AC LED on each power supply lights green. After a moment, the OK LED lights green. The Attention LED should be unlit. See Check Power Supply Status LEDs. If the AC LED does not light, there is something wrong with supplied power. If the OK LED does not light, there is something wrong with the power supply. If the Attention LED on a power supply lights, there is a fault in the power supply. If the Attention LED on a fan lights, there is a fault with that fan. Note - At this time, power is being supplied to the management controller. The controller is effectively on and booting up. You might see the boot sequence on the management console. Verify that the fans spin up. You should feel air going into the fans. The fan Attention LEDs should be unlit. See Check Fan Status LEDs. Verify that the chassis status OK LED lights. See Check Chassis Status LEDs. See Accessing the Management Controller.